If you’re going to choose an unconventional pet, pick this one. Despite being one of the most unique reptile pets available today, leopard geckos are relatively easy to care for. As they are extremely docile, they make an excellent pet for older children and adults. Their name derives from their naturally spotted markings on their skin and unlike other geckos, they possess movable eyelids. 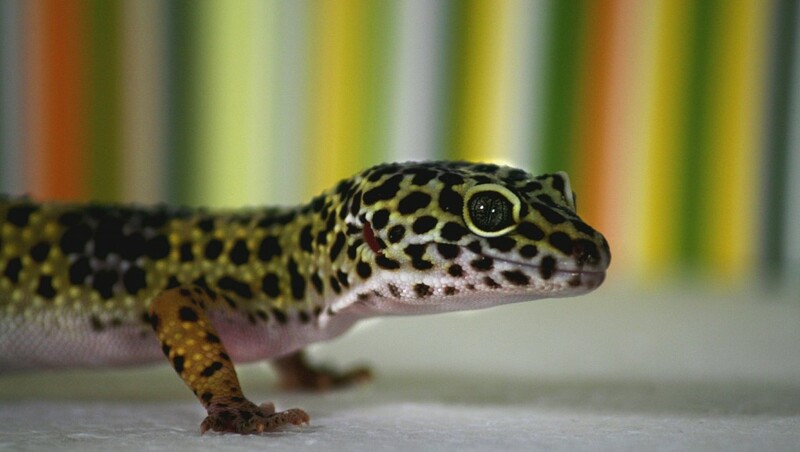 Leopard geckos have become a popular pet in the modern home and if cared for properly they can live for up to 20 years! The good news is that leopard geckos do not require a great deal of space and so are easier to keep. Like most reptiles, leopard geckos should be kept in reptile vivariums with glass doors. They are also nocturnal which means that they do not need the same special lighting requirements as many desert reptiles. Leopard geckos will choose an area in their enclosure where they feel most comfortable and do not over-heat. However heat is a very important factor and needs to be provided by a heat mat or a heat rock. Additionally, lighting from above is desirable not essential as it provides a source of vitamin D. There should also be areas of shelter in order that the leopard gecko can hide and feel more secure as they prefer to live in solitude. After all, it is in their nature to delve underground. DietLeopard geckos can eat purpose-made reptile food, but they also feed on crickets, waxworms, mealworms and super worms; which should all be served in moderation and varied whenever possible. Check out our new range of live food for reptiles. Additionally, serving a small dish of calcium powder can be beneficial as it ensures healthy growth. Generally, it is best to feed juveniles every other day and adults every two or three days. To keep your leopard geckos hydrated, it is essential to have fresh water available at all times in a small bowl. How To HandleLeopard geckos do not mind being handled once they have got to know their owner. In fact, they rarely bite or scratch and will only struggle if they are frightened. The best way to hold them is by their shoulders gently but firmly and make sure to support the weight of their body with your other hand.  If you would still feel more comfortable using tools, we offer a selection of reptile feeding and handling tools on the Pet Express. Health and HygieneAnother good piece of news about these reptiles is that their home does not need to be cleaned as often as a small animal home. However, pet owners should always wash their hands after handling their pet, and pet food dishes should be washed separately. In addition, it is natural for all lizards to shed their skin, however it is often eaten so is not normally seen. In order to help them with this, it is important that they have access to a damp area such as a hide with damp moss. 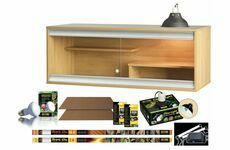 Specialist vivarium cleaning equipment is available and can be ordered directly from our site. Leopard geckos are normally problem free as long as they are given the correct food, care, attention and environment. The most important aspects of their care are providing heat, food and vitamins to avoid all long-term problems. 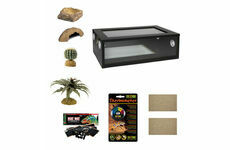 Get started today with a fantastic vivarium starter kit in order to keep your first reptile. 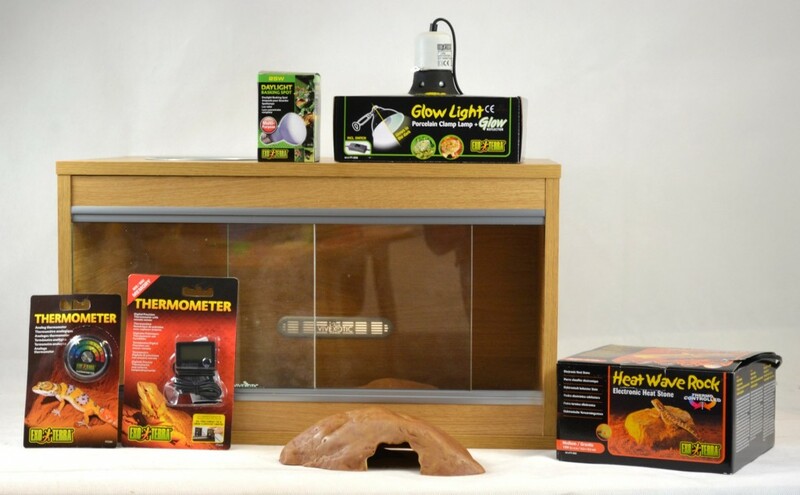 Including heating, glass doors, decoration, a feeding bowl, thermometers and full instructions, it provides everything you need for the correct environment for your leopard gecko's welfare.